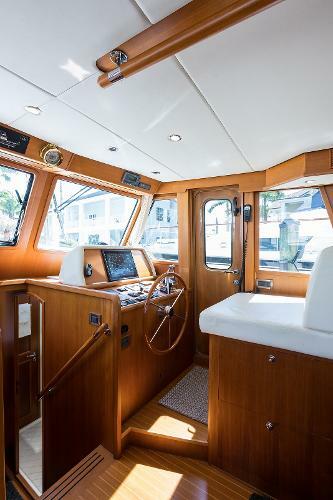 MOXIE is a 2011 Grand Banks 41 Europa. Moxie received an update at the GB production facility in 2014 that put her in almost new condition. 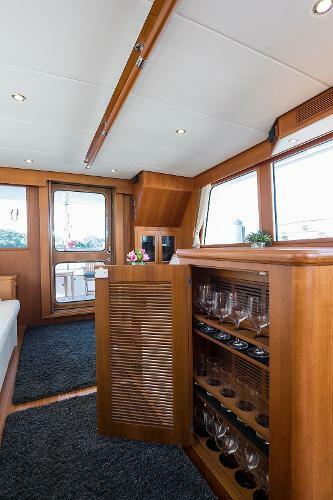 She offers some features other 41 EU’s do not have. She is for sale as her owner is purchasing a larger boat. 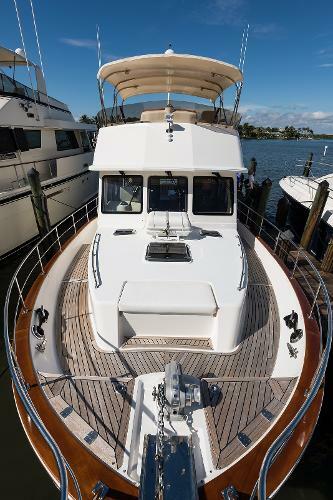 This Grand Banks 41 Europa has 425 hp Cummins engines with Zeus pod drives. 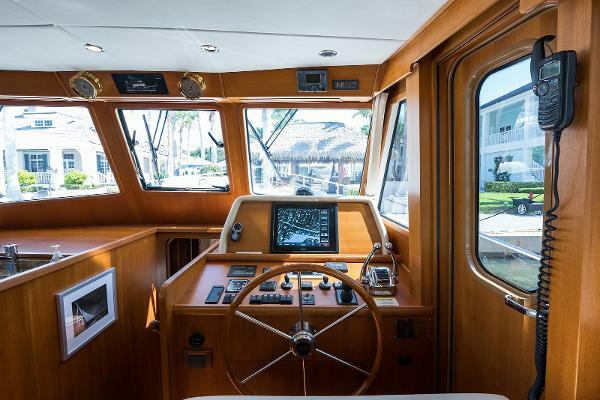 This makes for dependable cruising with drama free docking. 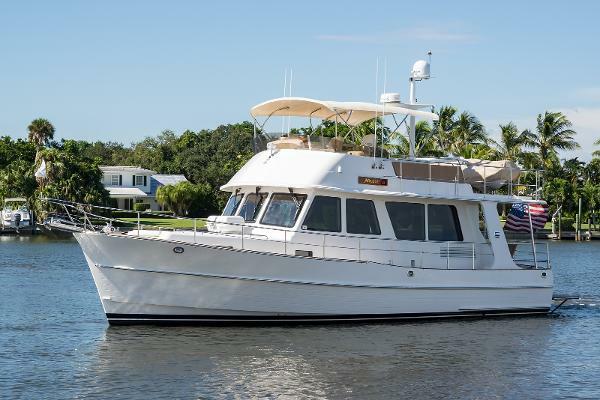 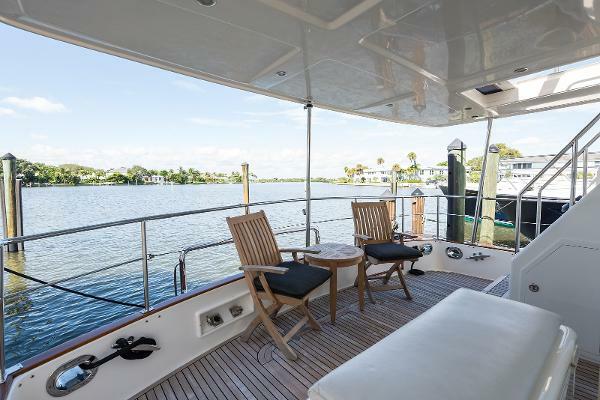 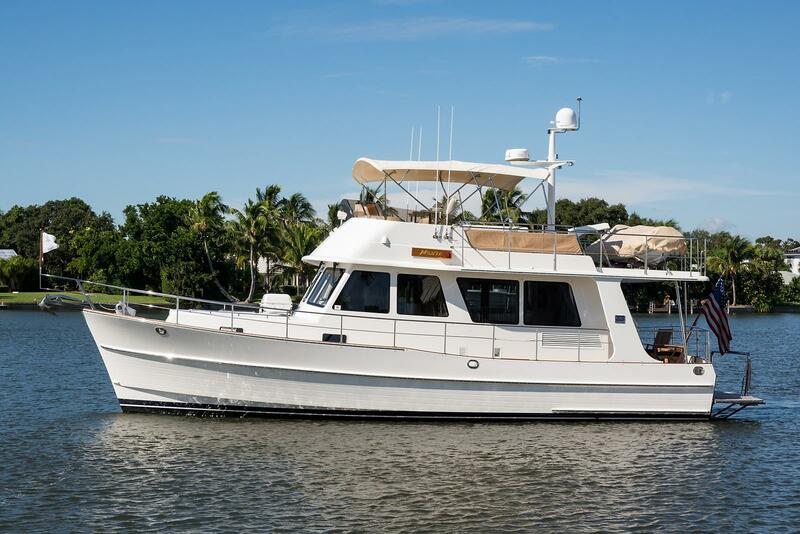 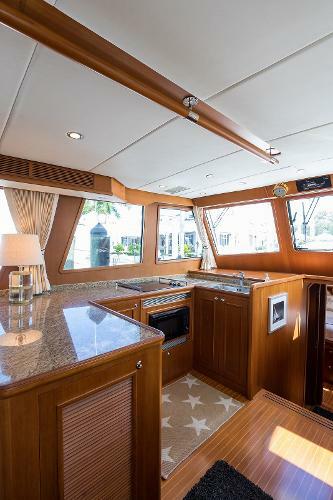 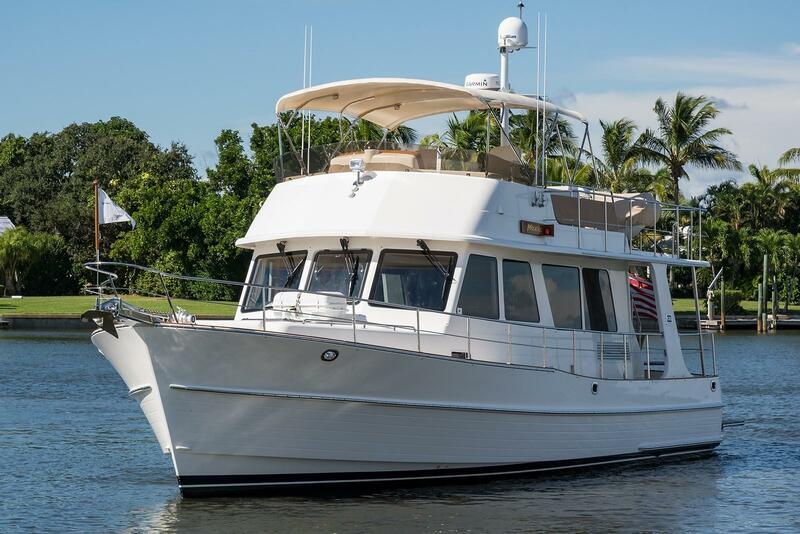 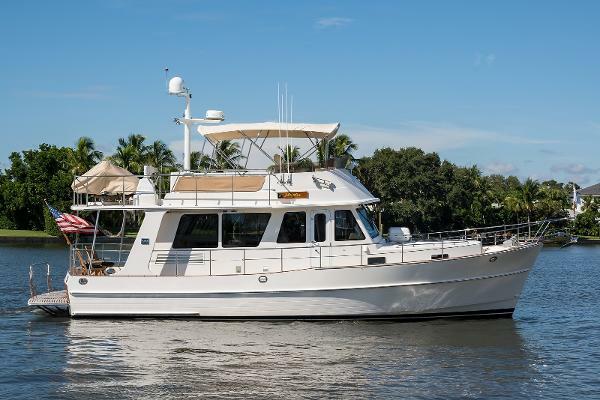 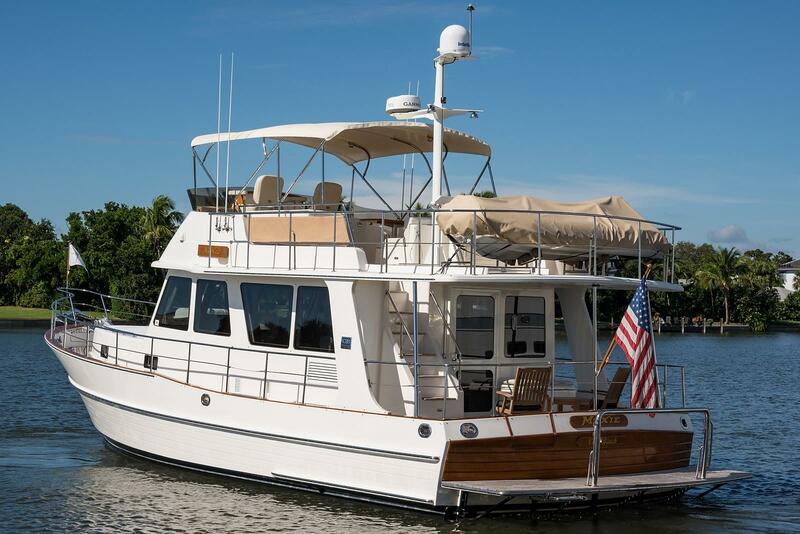 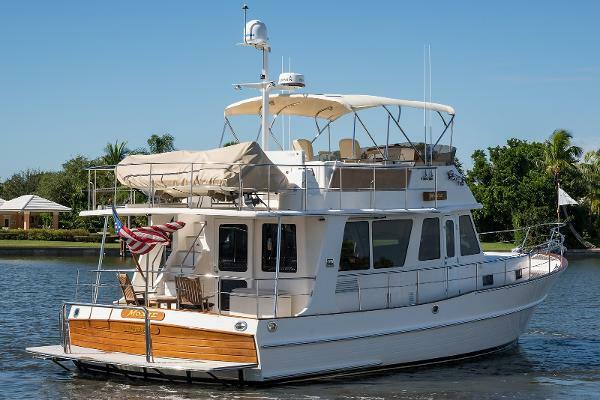 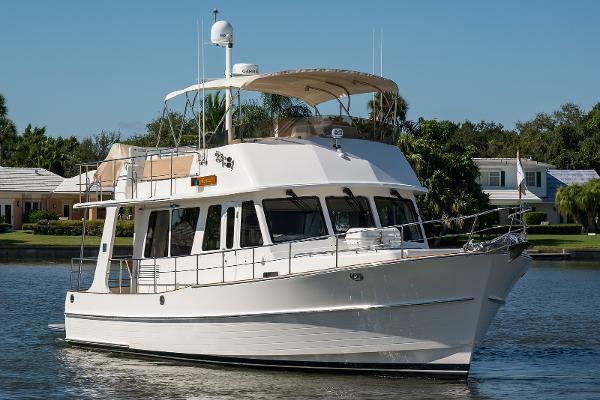 The 41's have enjoyed great popularity offering large upper galley, two staterooms, large head and huge "basement" storage! This is a rare later model 41 that is ready for her next adventure! 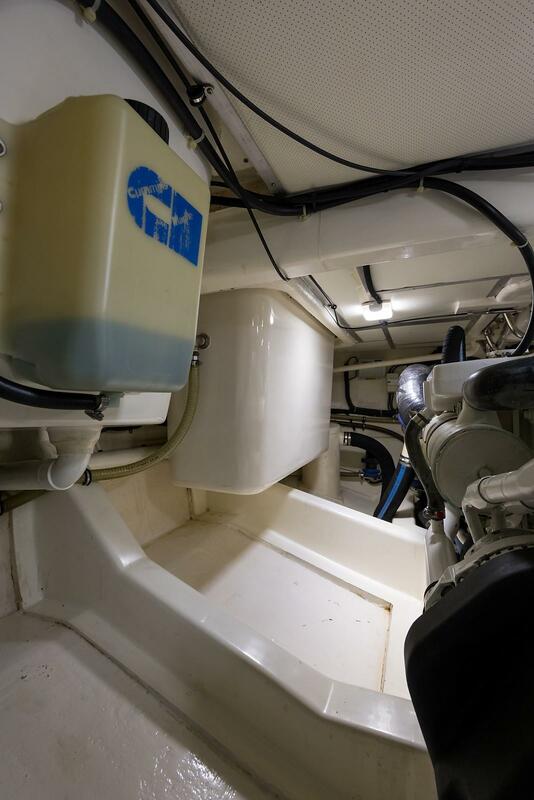 BRIG 10' left console dinghy with Honda 20 HP outboard and cover, included in sale. 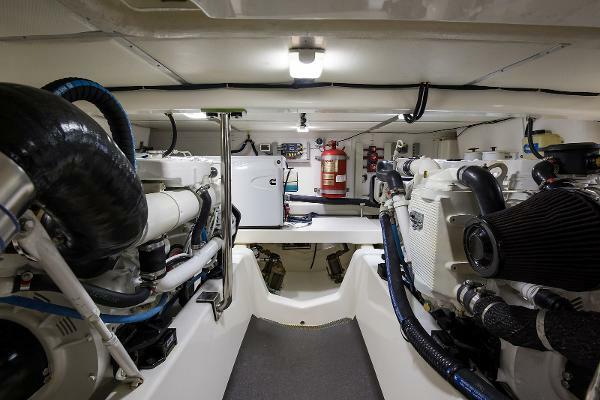 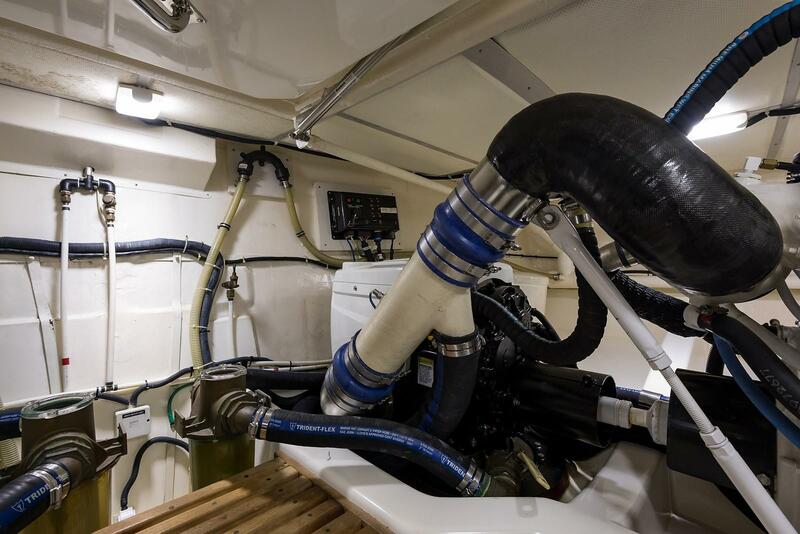 The current owner spent more than $100,000 reconditioning pods and providing extensive maintenance to all systems in engine area; not due to any disrepair but because he wanted MOXIE to be perfect! She is turn key and ready for her next cruising adventures. Grand Banks continues the same time honored tradition of boat building that has built its iconic name brand, for the past 61 years. 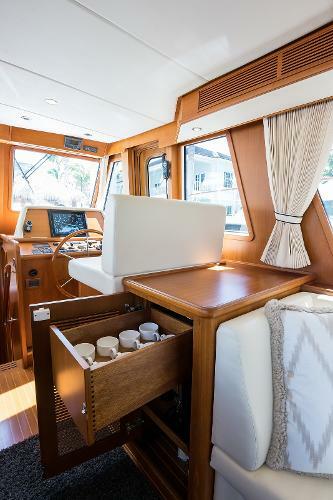 MOXIE has had extremely good mechanical care since new. 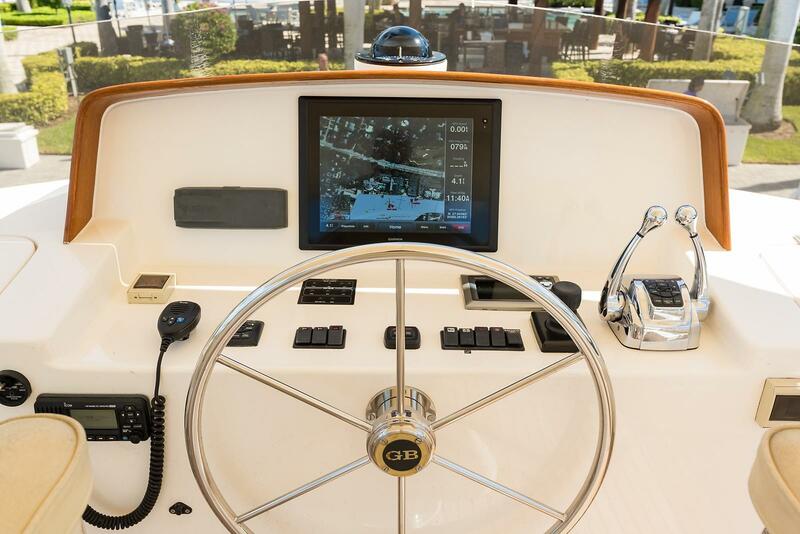 Her Zeus pod drives enable even novice boaters to look like experts while docking. The optional Sky Hook feature, holds the boat in place (within 10') without an anchor while waiting for a bridge to open or gives one enough time to put lines out before coming into a marina if single handing. She offers the following standard and optional features. MOXIE has world class Grand Banks wiring that is reliable and easily traced if an issue arises. 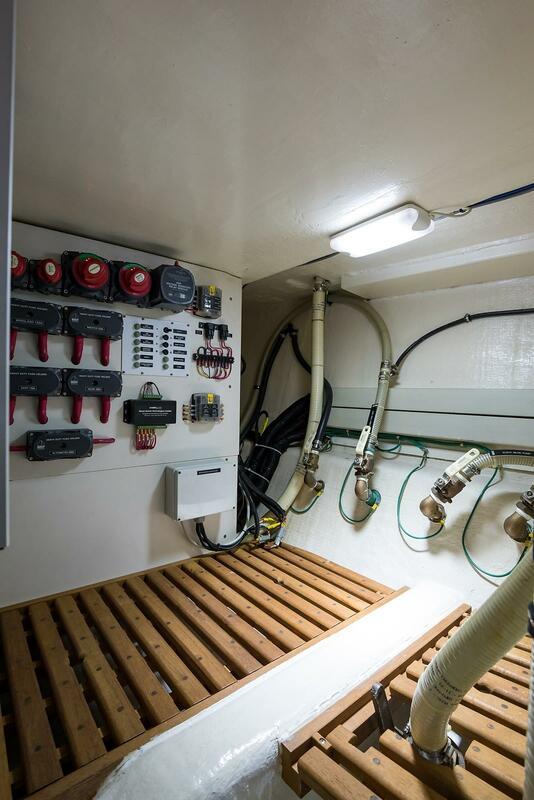 There are full electrical schematics (for this boat) that pass to the new owner. 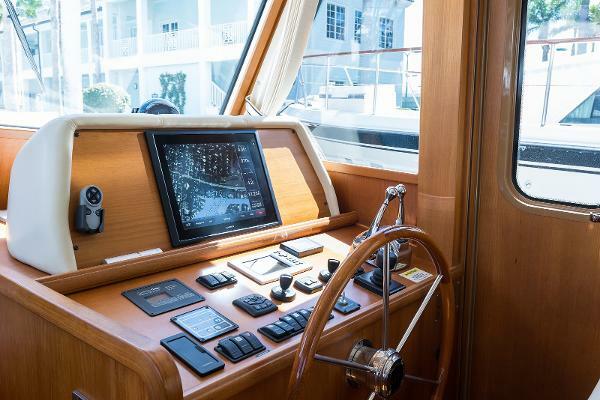 This saves a tremendous amount of guesswork if a problem occurs. MOXIE has full teak decks. This gives you good grip-page in wet conditions and is less hot in sun. 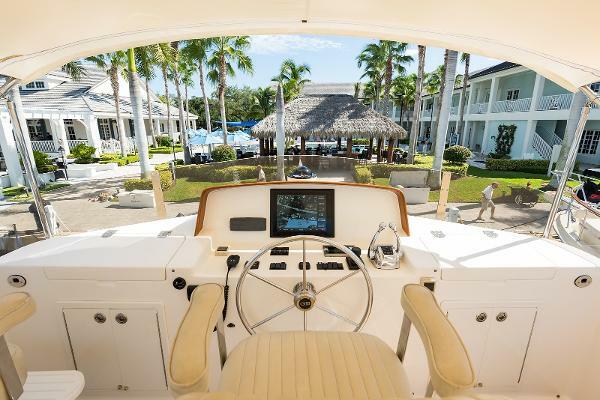 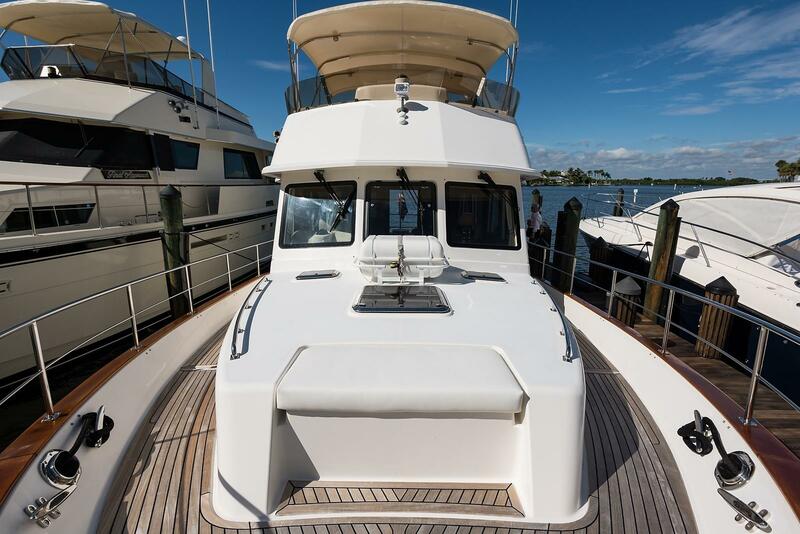 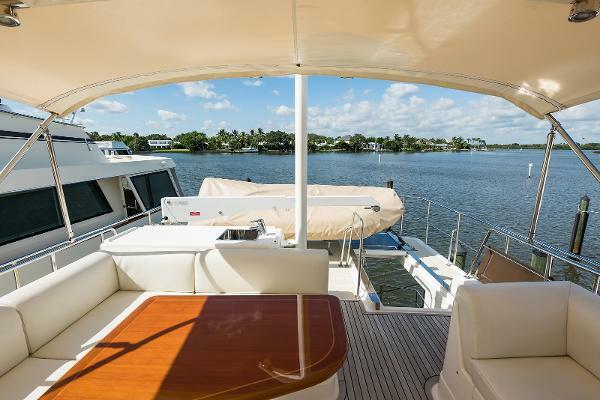 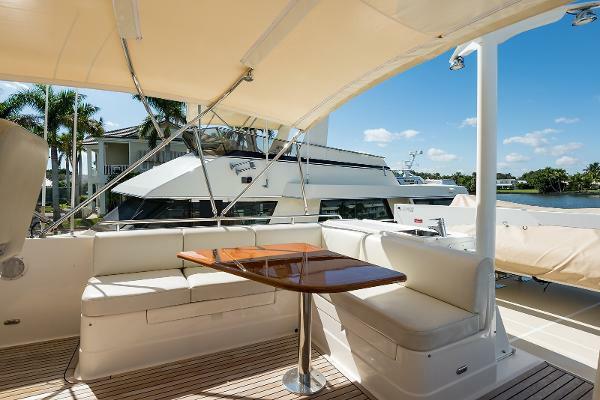 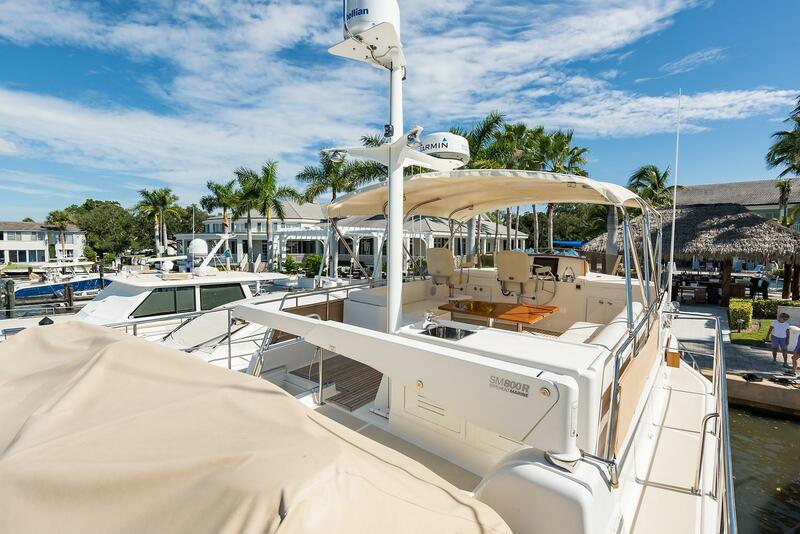 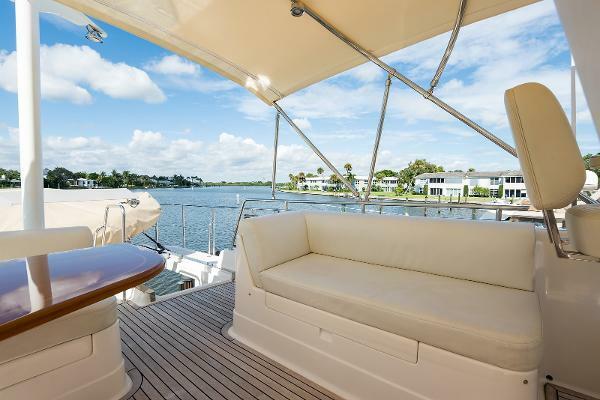 The side and aft decks are covered by the extended flybridge hardtop and they are in excellent condition. There is painted Awlgrip non-skid "Moon Dust" on dinghy area, that gets full sun. The Bimini shades the helm, seating and teak decking. 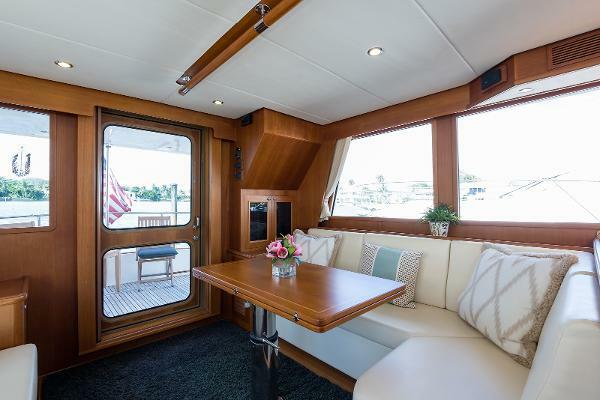 The aft deck on MOXIE is spacious. 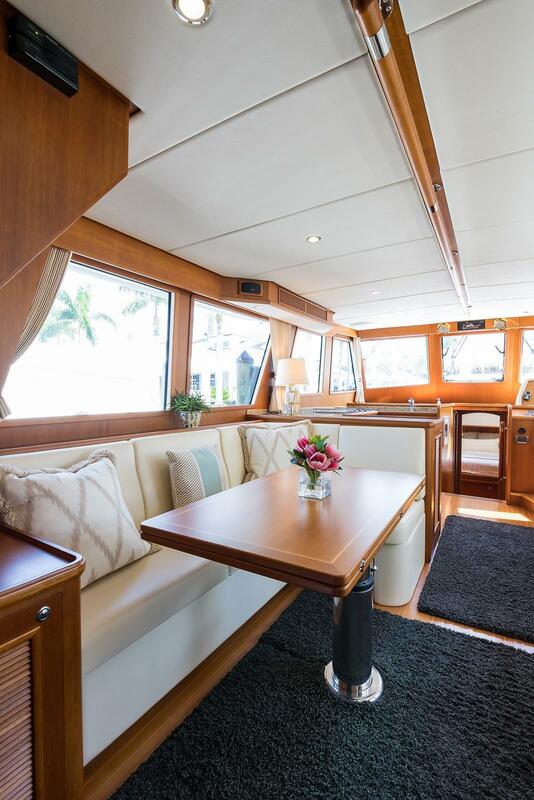 There is room for teak chairs and table, included with canvas covers. 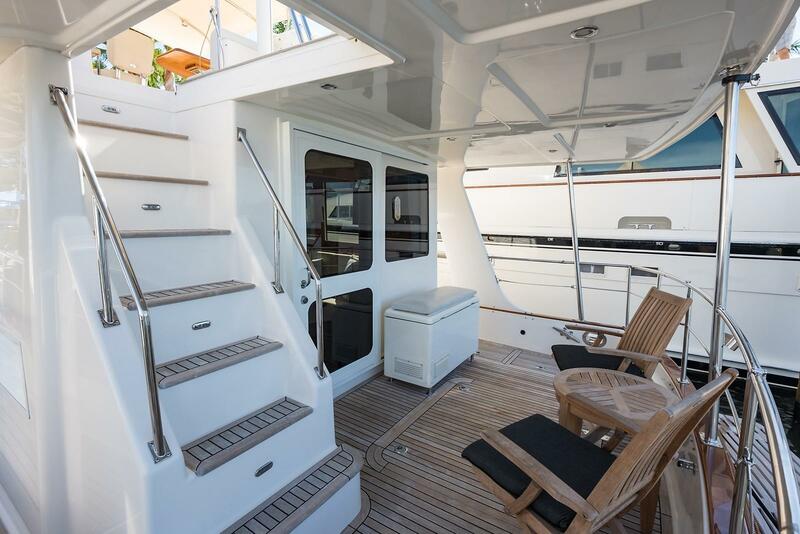 Easy flybridge access is done by stairs where you can face forward as you come down, with a stainless steel handrail. Also, very convenient for pets. The lower helm area is opposite the galley. 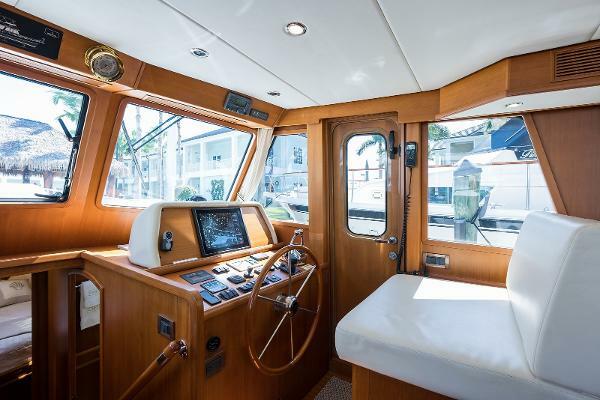 A double wide helm seat is next to a helm side door that gives one immediate access to the starboard side deck, if necessary. 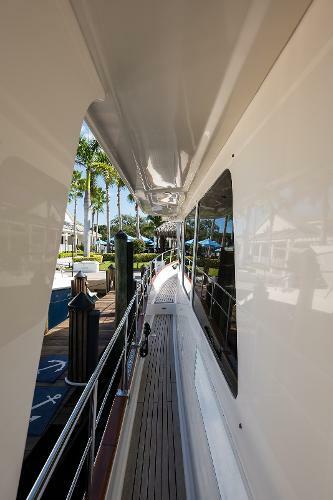 The helm door also has a Phantom sliding screen to give the boat additional ventilation. The left windshield also opens. There is a large built-in storage cabinet behind helm seat. 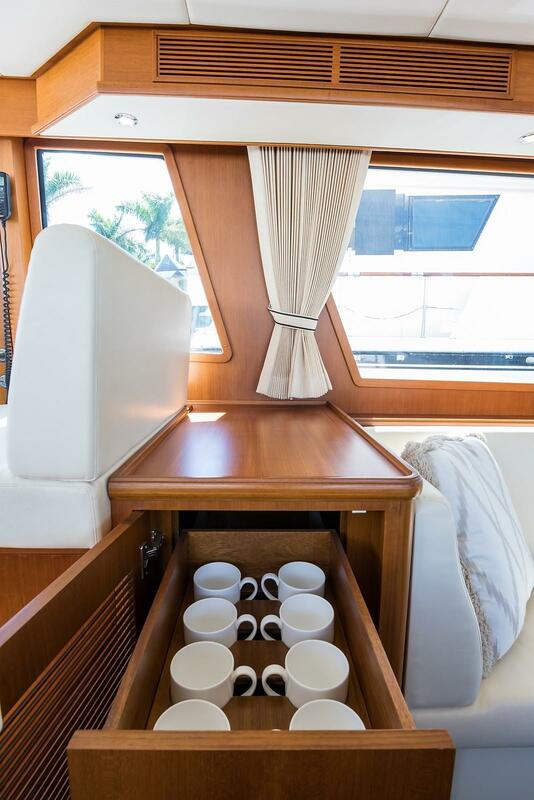 There are also (2) drawers to enhance galley storage, under helm seat. 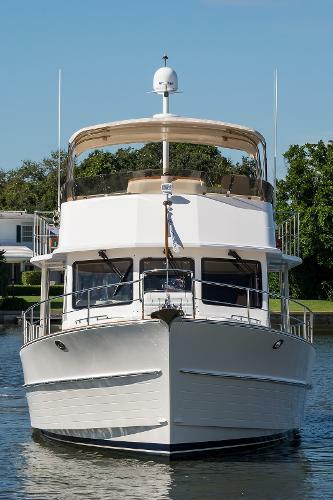 MOXIE has both upper and lower helms. This enables boat operation in all kinds of climates and weather. The 41 Europa flybridge is very large for a boat this size. That is due primarily, to her wide 15’8” beam. There is seating for 10 including large settees and (2) helm chairs. There is also a fiberglass cabinet aft of L-Settee, with sink, faucet and storage. 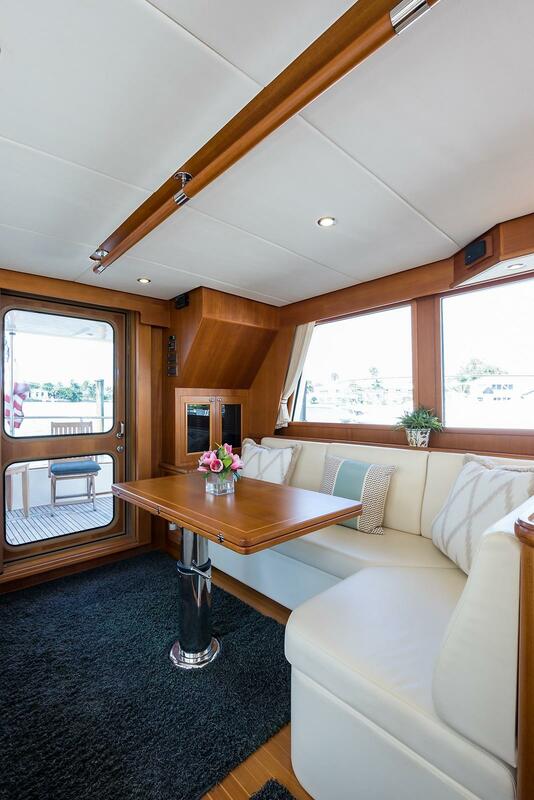 The Salon has 360 degree views with large windows, while seated. The aft Salon door has glass embedded both on the top and bottom. There are facing settees for easy entertaining and a comfortable place for a couple to lay down while watching TV or napping. 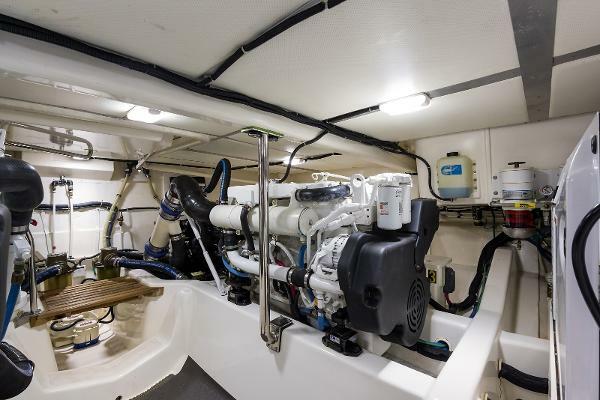 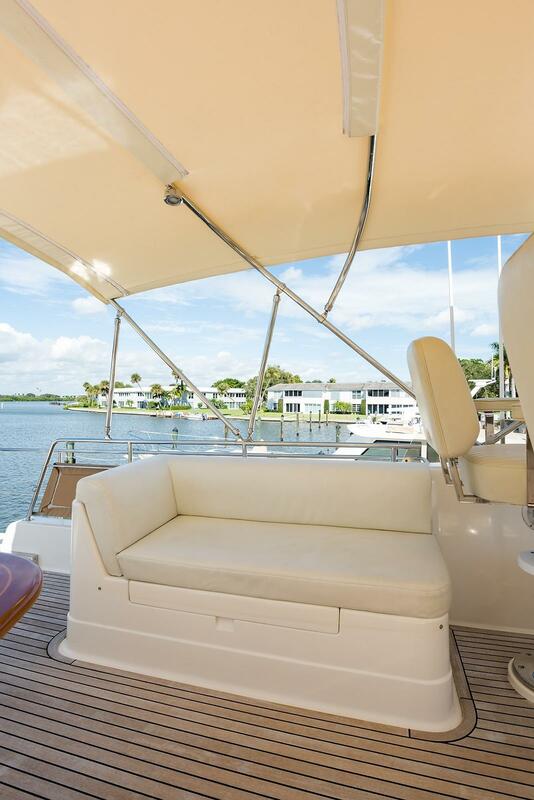 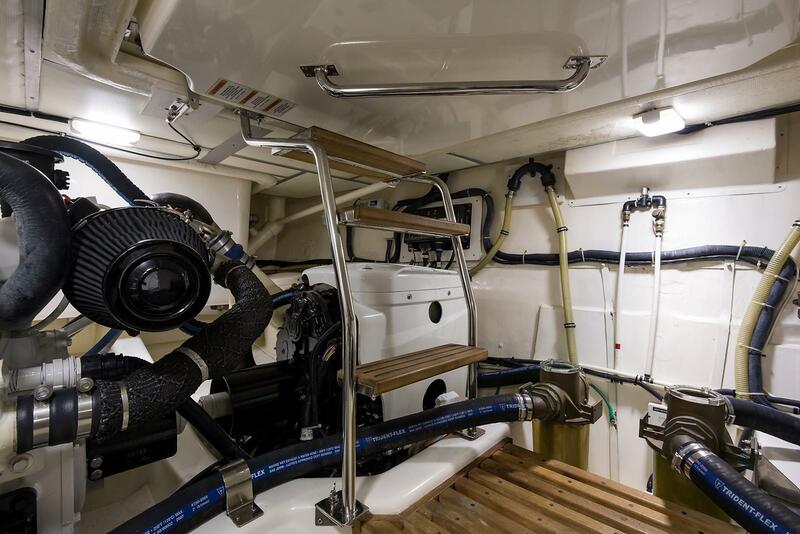 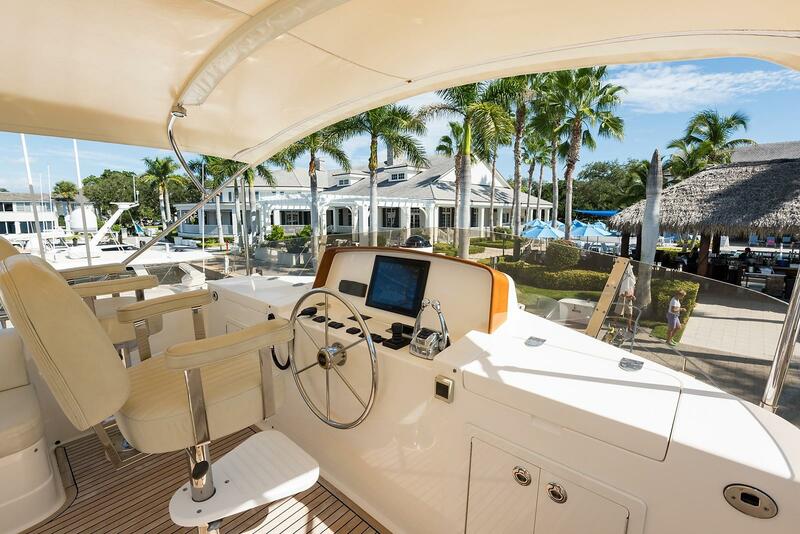 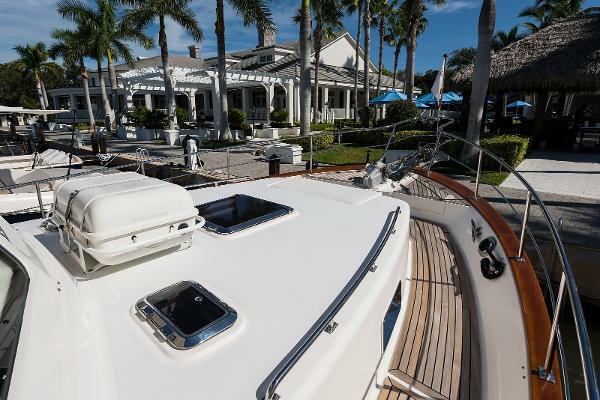 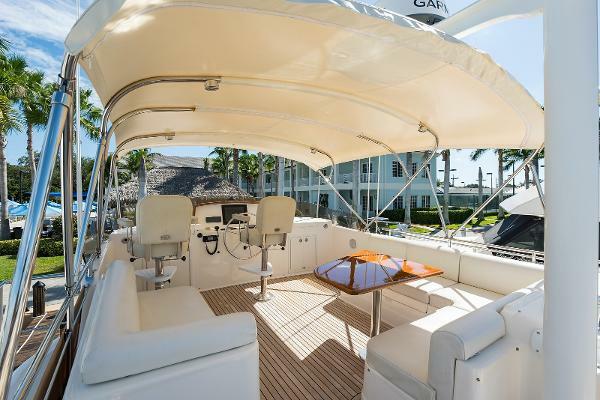 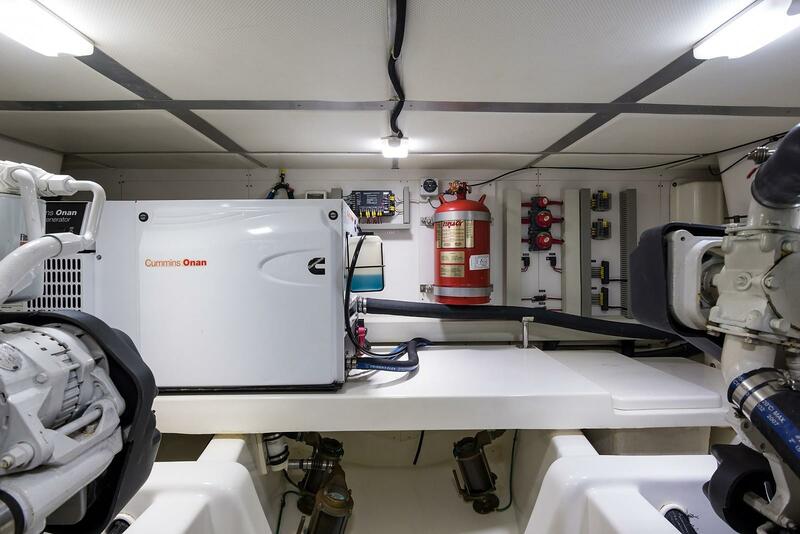 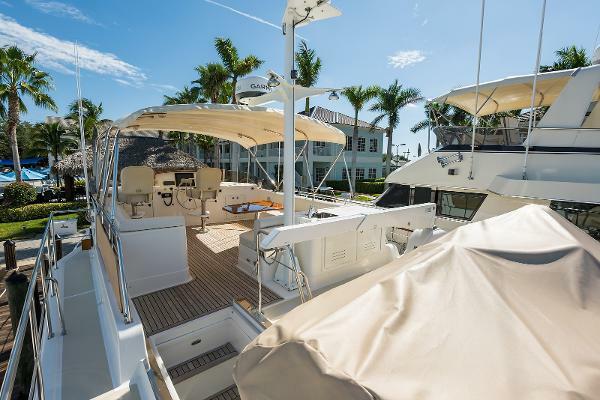 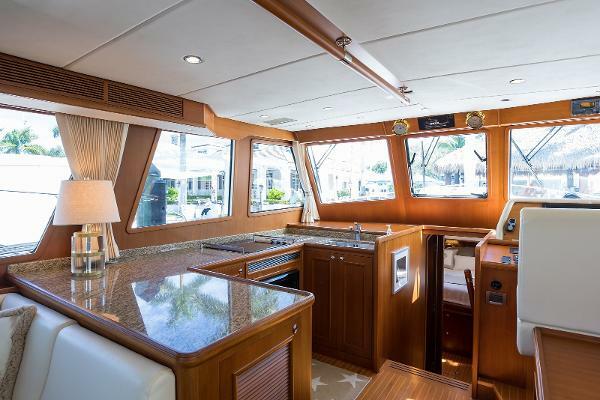 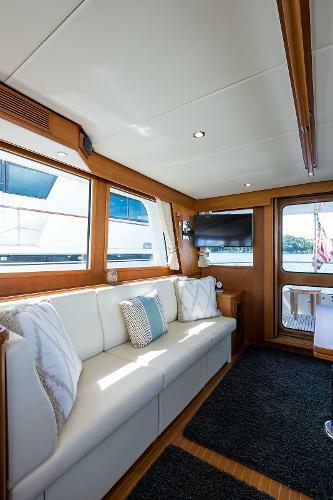 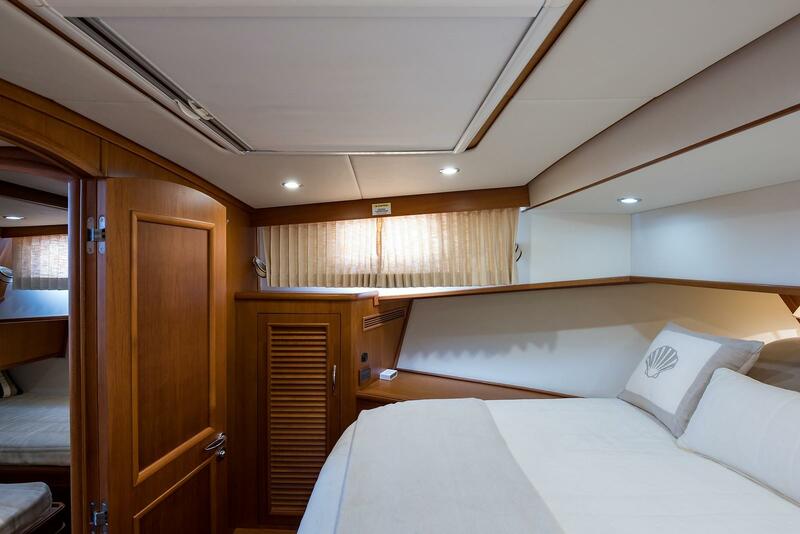 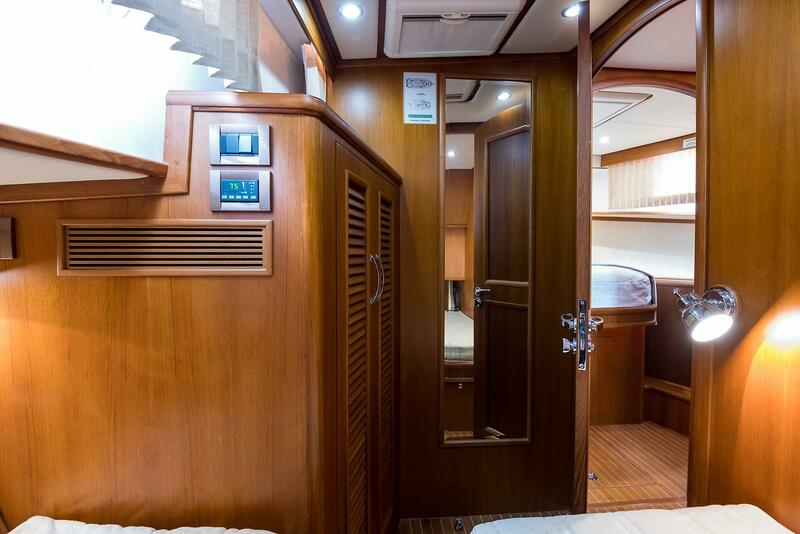 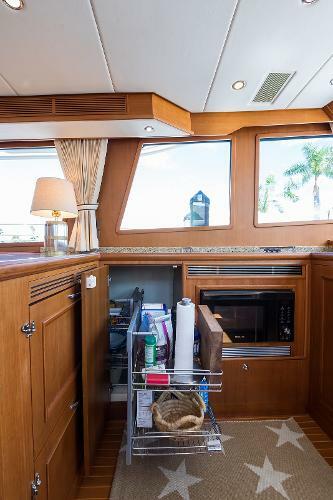 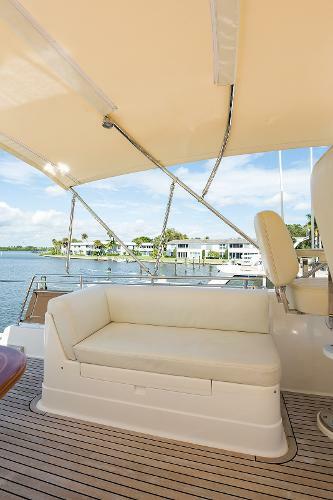 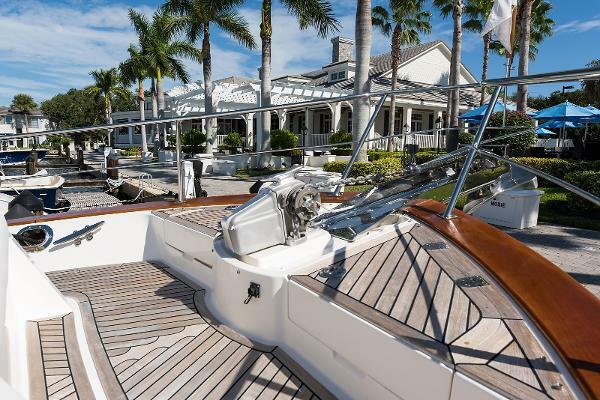 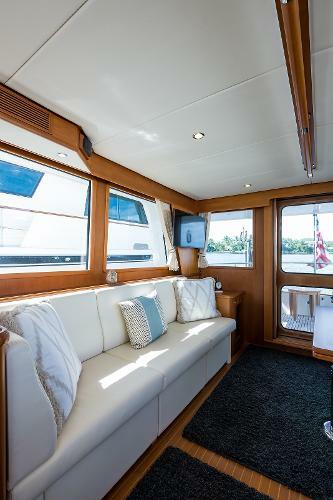 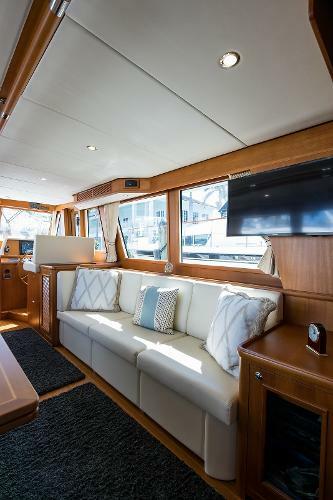 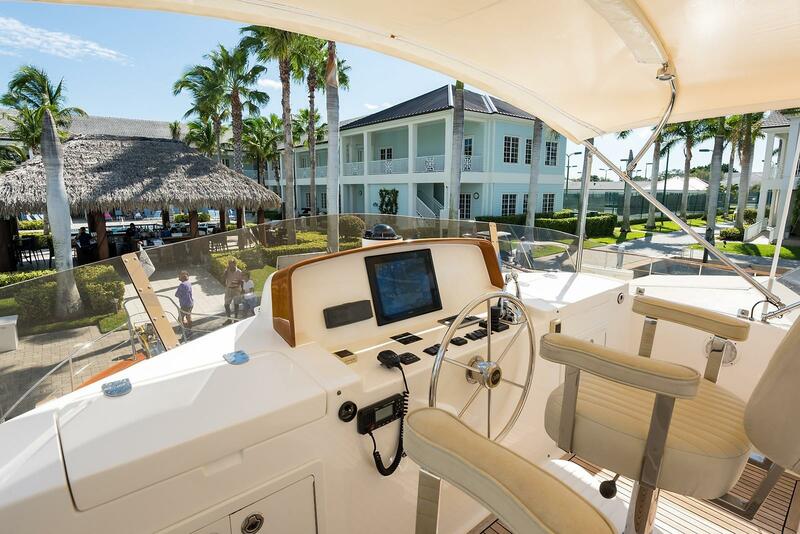 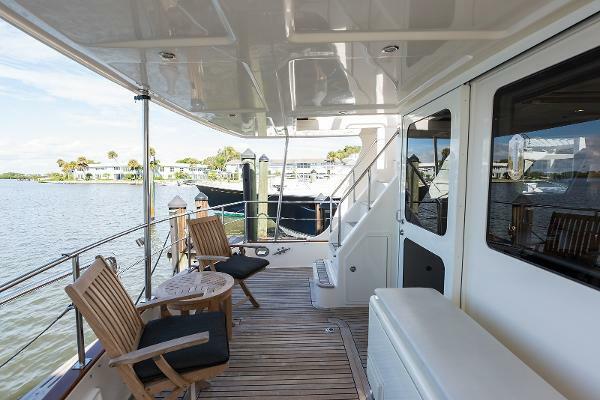 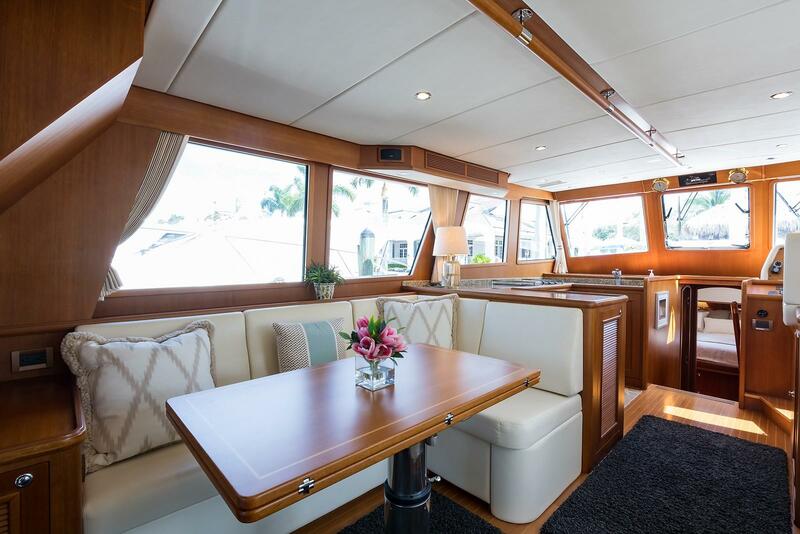 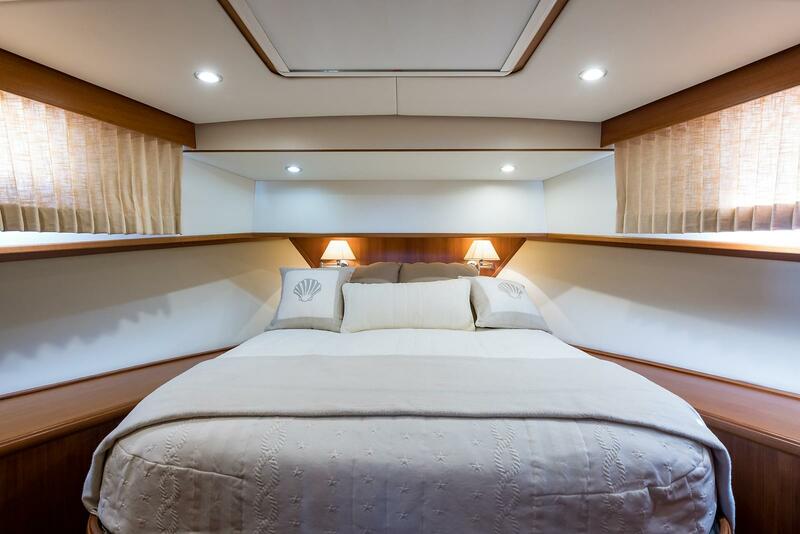 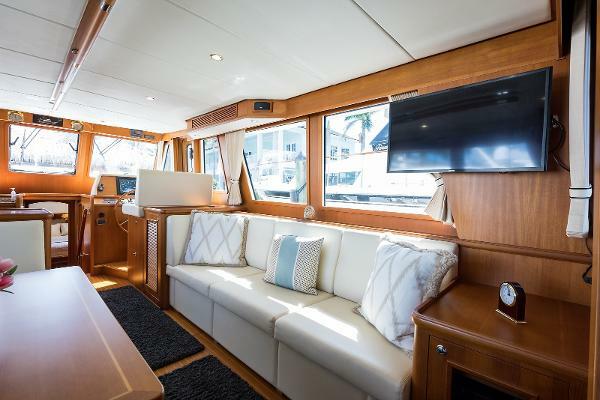 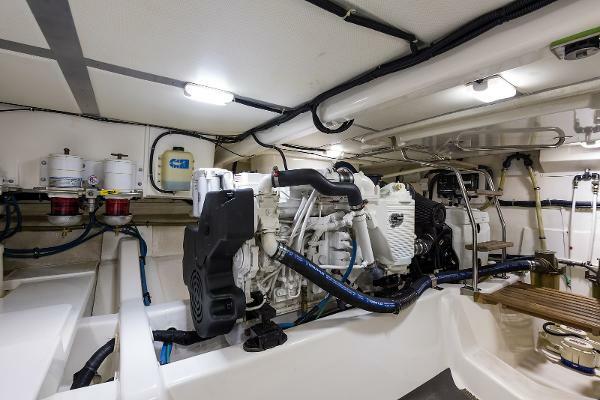 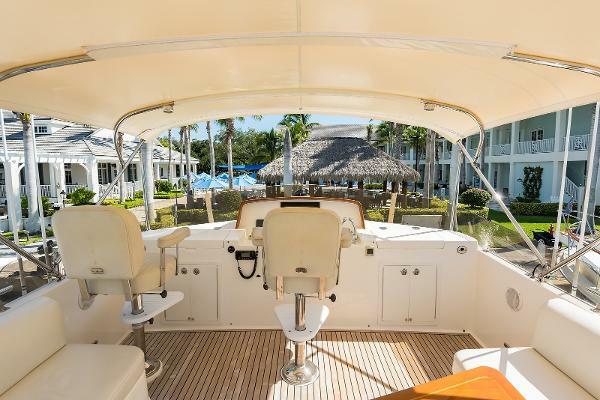 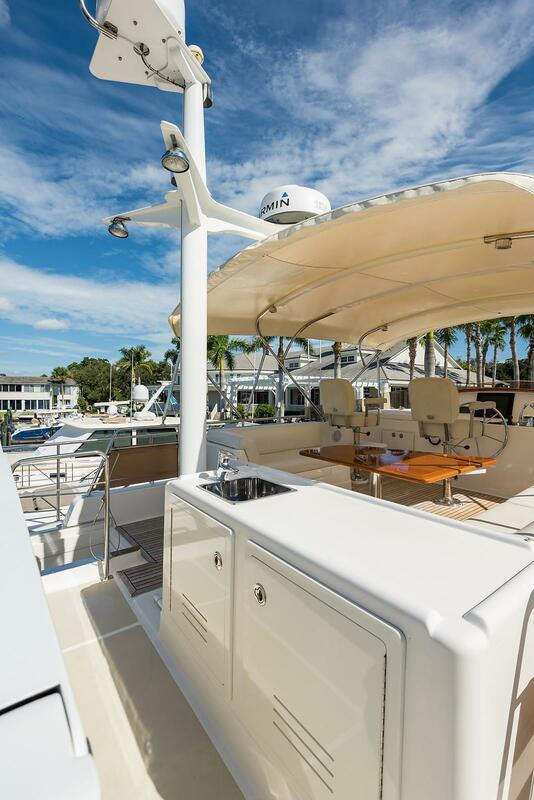 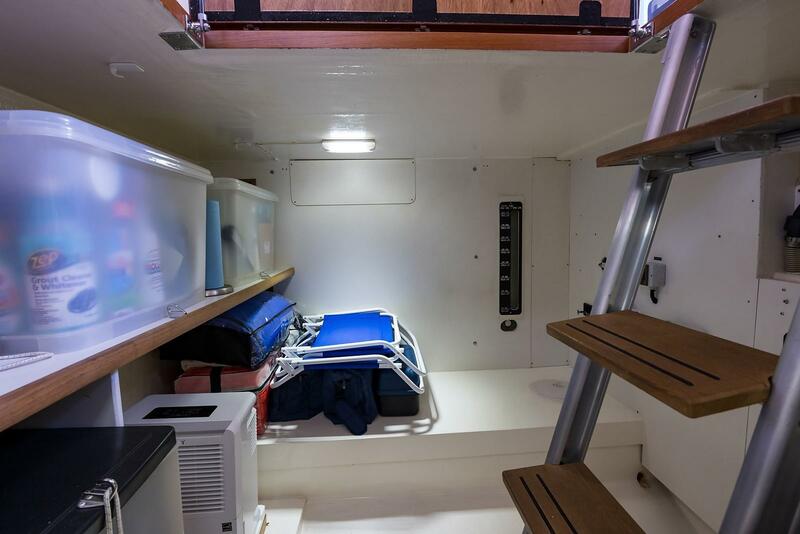 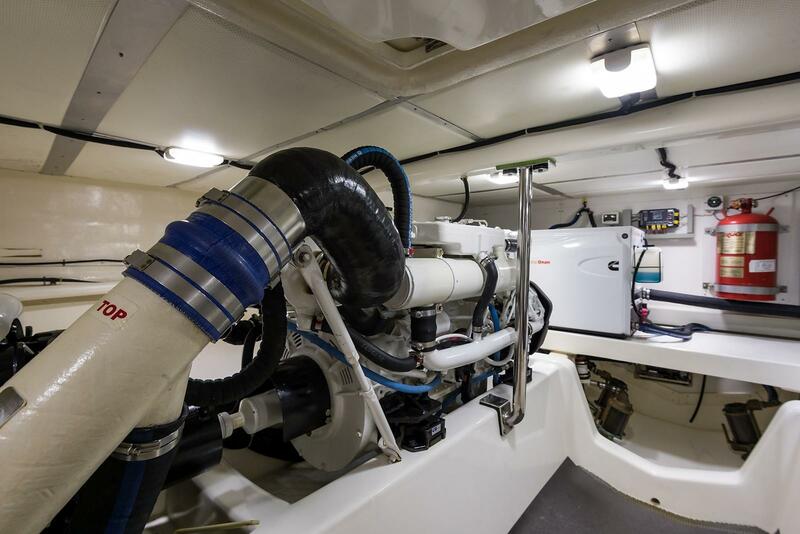 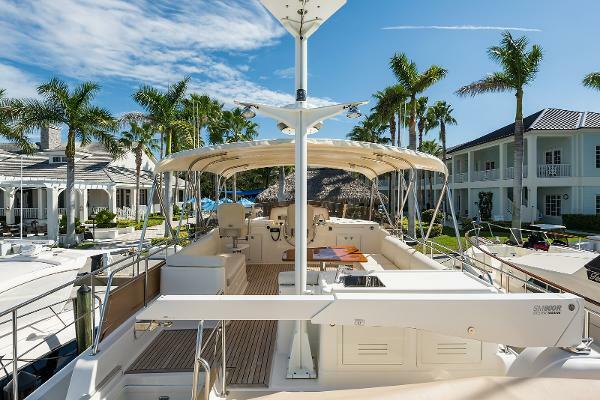 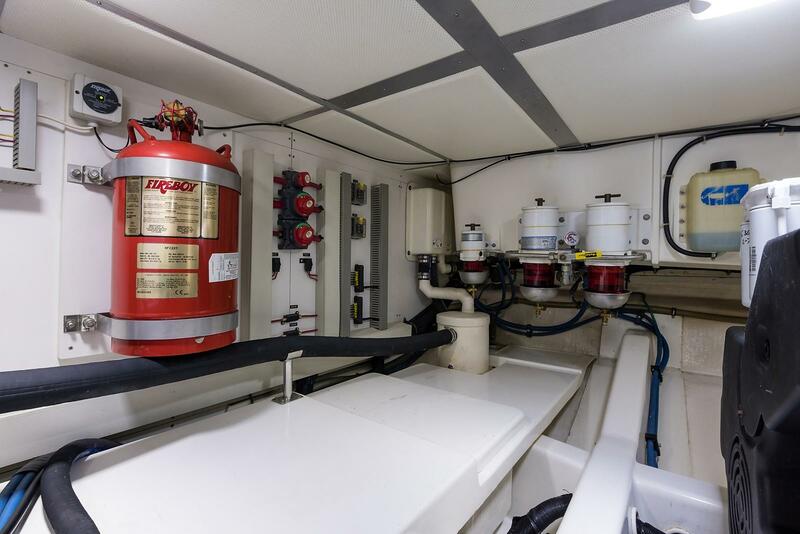 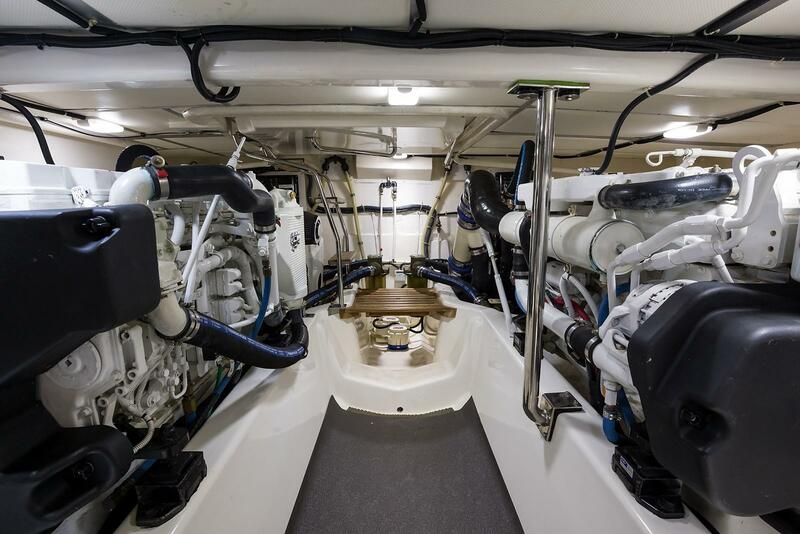 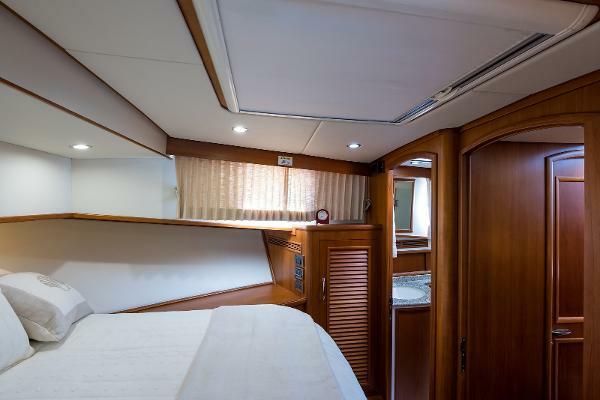 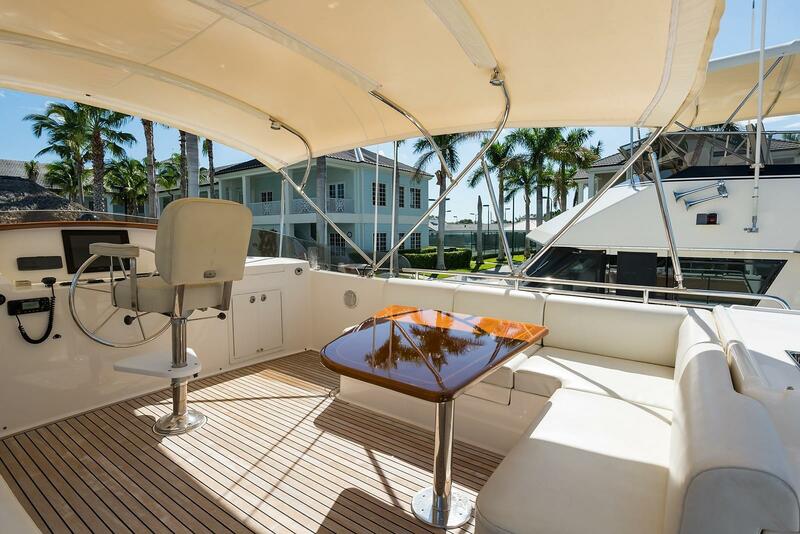 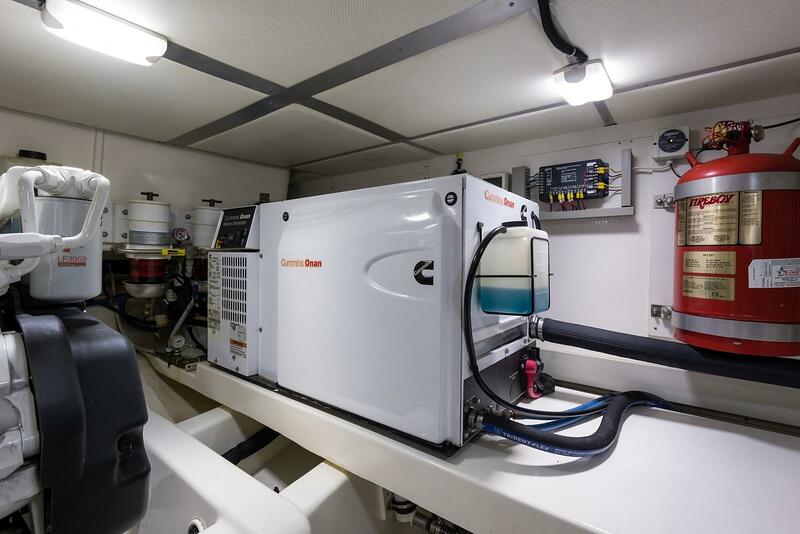 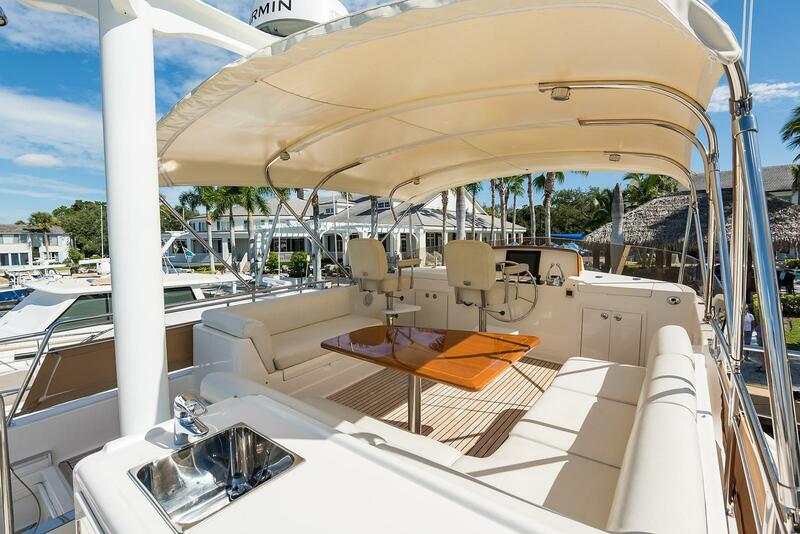 The air-conditioning is delivered through an overhead valance system that evenly distributes the cool air through the salon, galley and helm area. The GB 41 EU galley, is much larger than most boats this same size. There is plenty of waist high counter space with cabinet reach-in shelved storage. 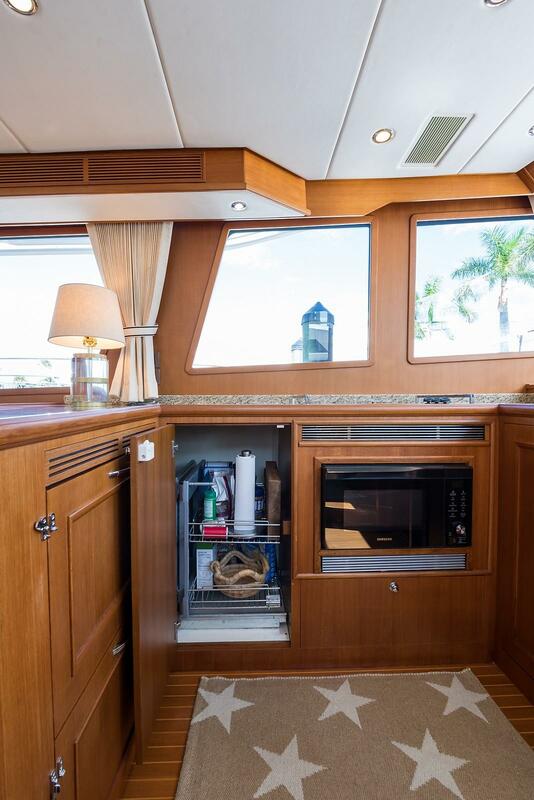 There is also a stainless steel pull-out pantry system that fits into the aft outboard corner. 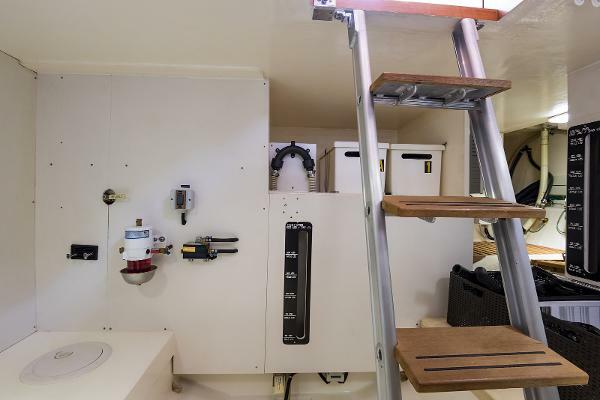 The Utility room is located under the galley, helm and part of the salon soles. 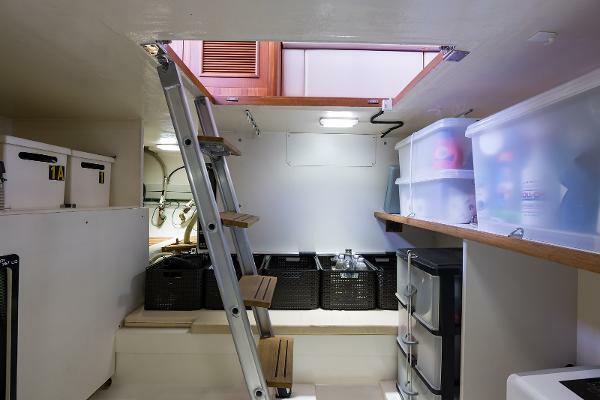 It is large with a removable slanted ladder for easy access. 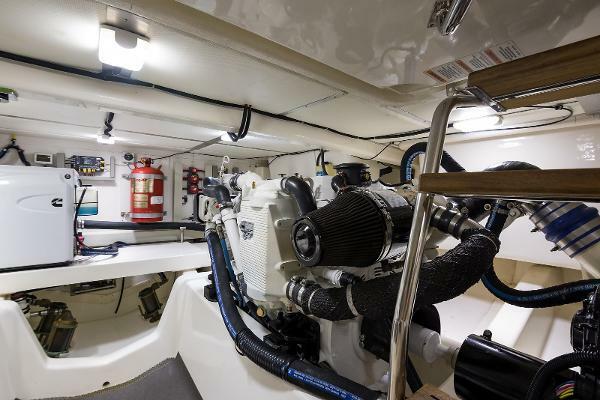 The fresh water and (2) fuel tanks are built-in forward and outboard with sight level views on all three. 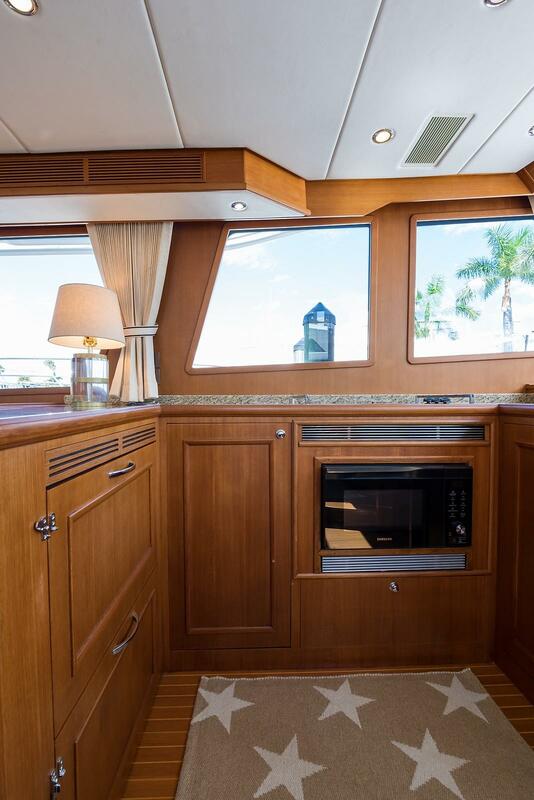 The forward master stateroom offers an Island berth with drawer storage under. 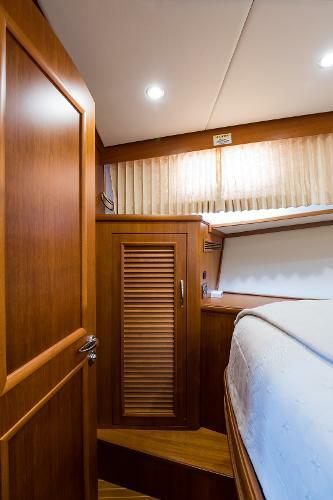 There is a cedar-lined hanging locker on both Port and STBD. 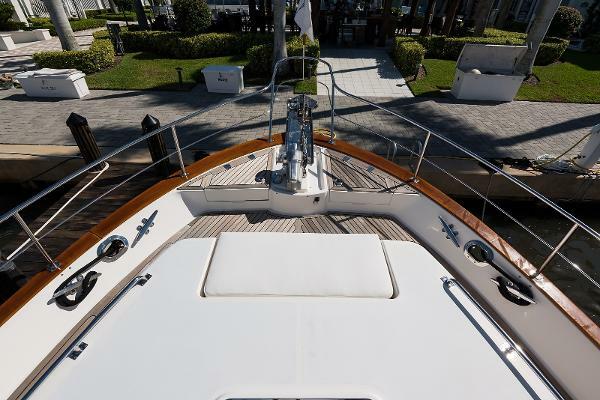 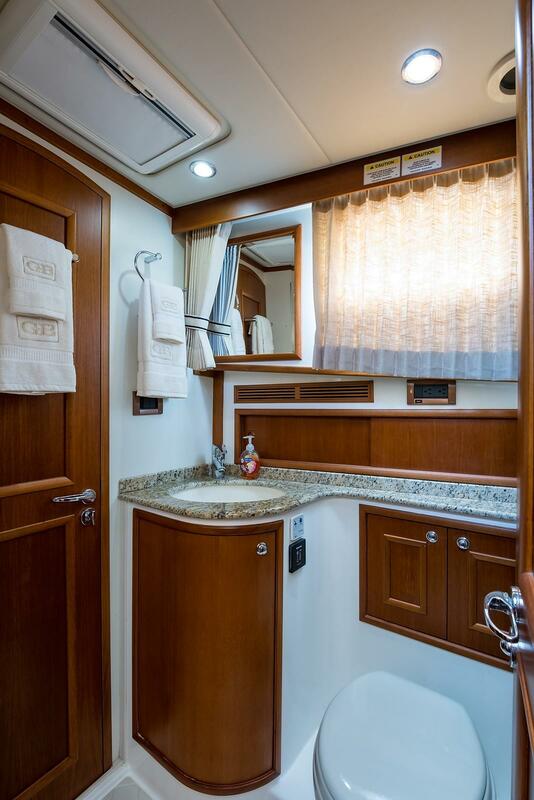 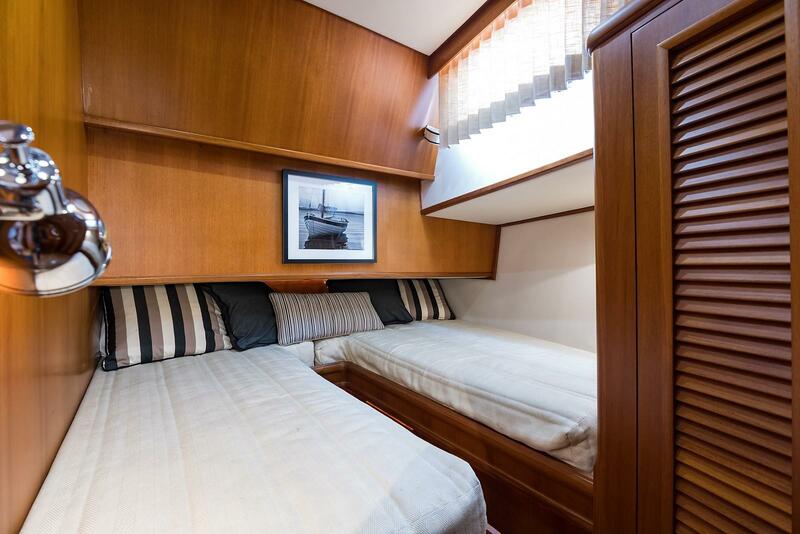 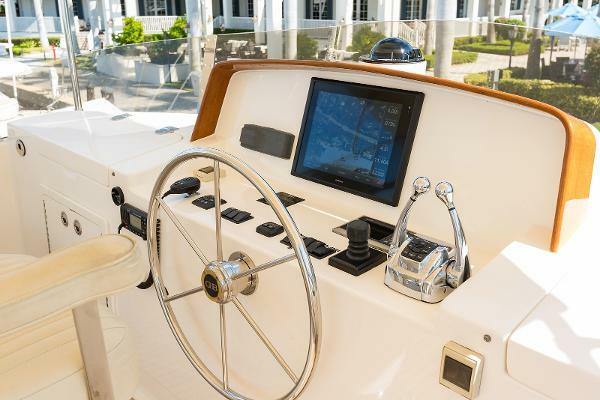 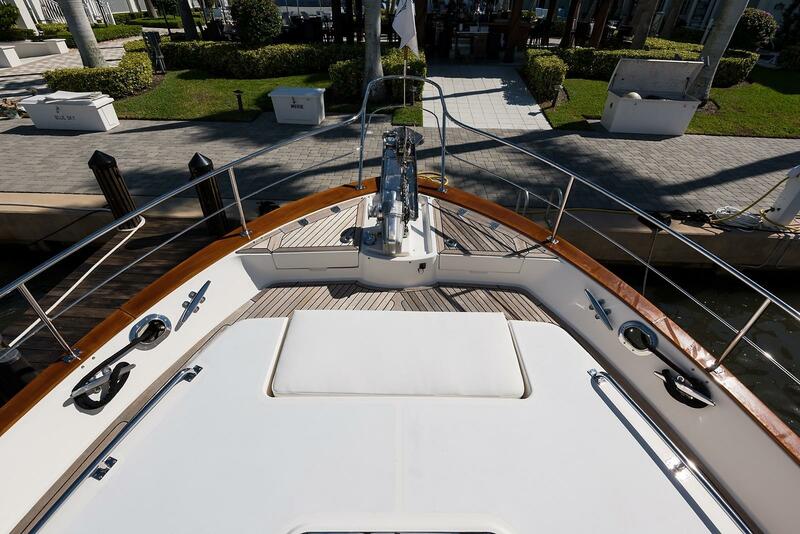 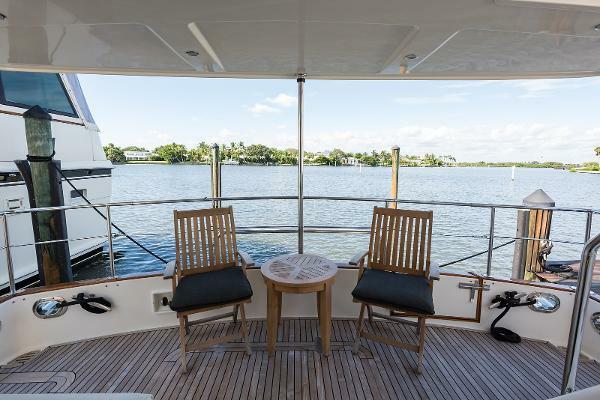 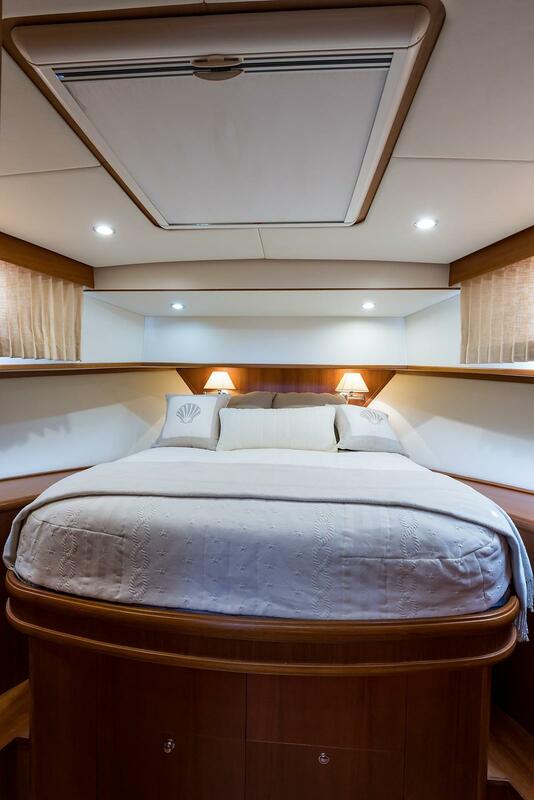 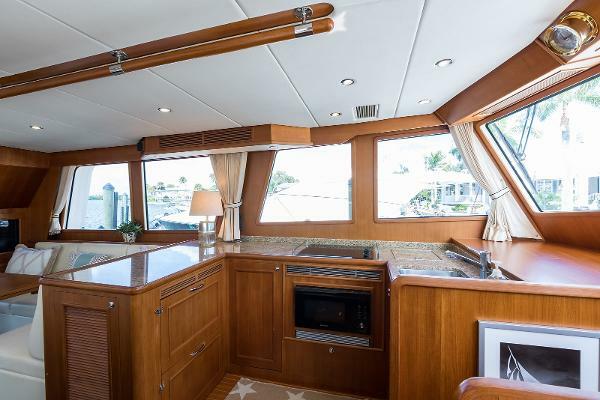 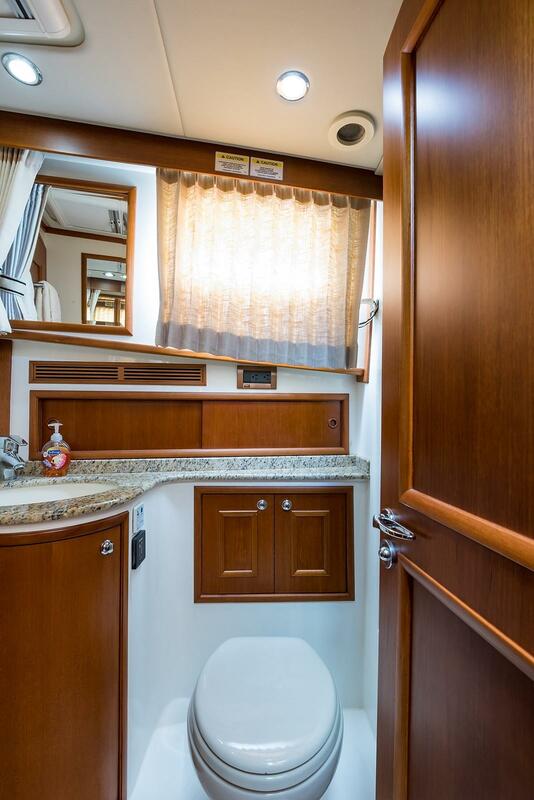 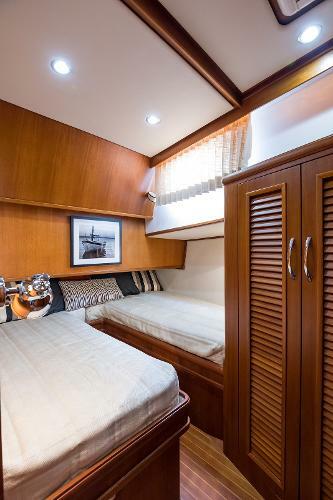 The master head is ensuite and accessible from the companionway as well. 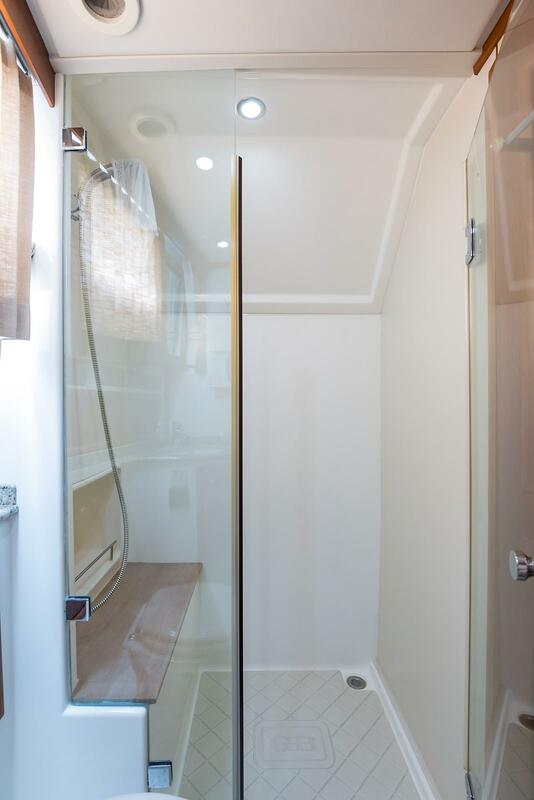 The sole in main head area and separate stall shower both have sump pump drains and are triangle pattern Corian for easy maintenance. 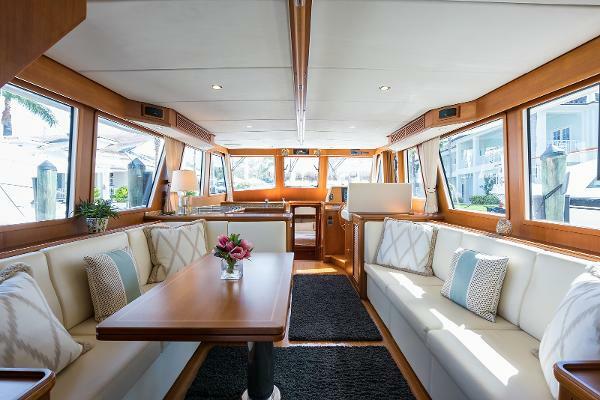 Moxie's interior is spotless and near perfect. 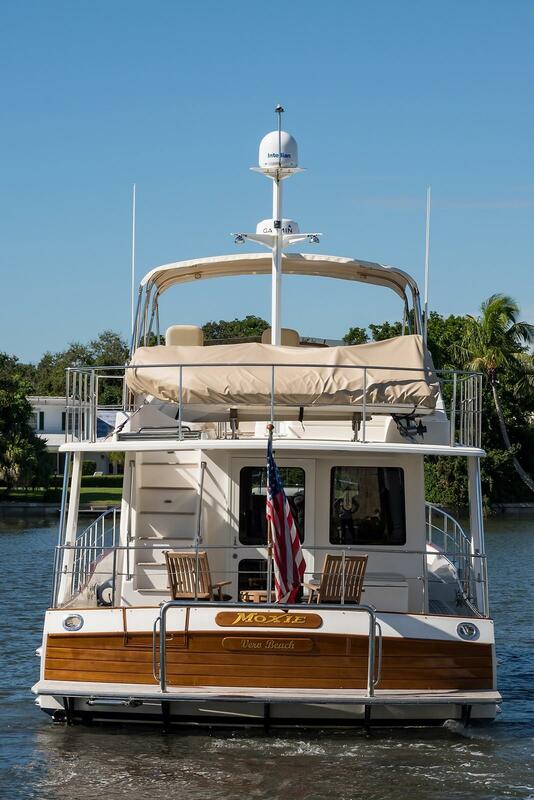 She has had very good care and it shows. 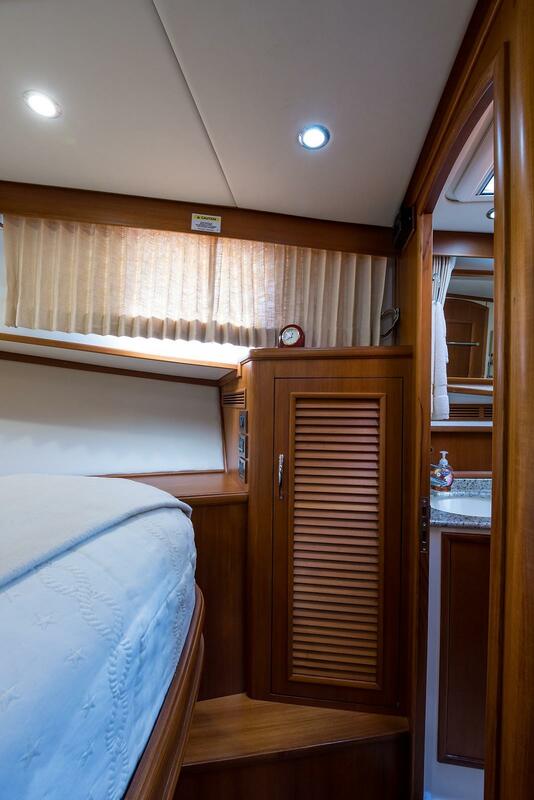 Owners' personal items, salon table lamp, and salon pillows. 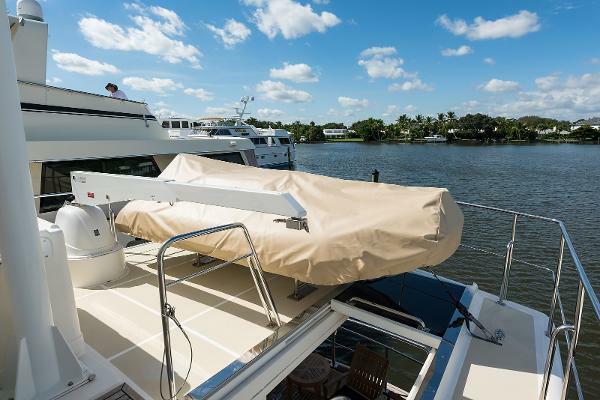 A complete list will be provided upon request.